Ivan Miklos was never fighting for reedom, he is not liberal, never was and never will be. 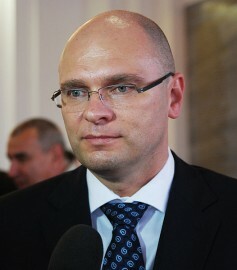 He is not even a creator of flat tax reform in Slovakia, it was idea of Richard Sulik. Though I would hardly call Richard’s party libertarian-leaning, he is my hero for willing to stand against EU bureaucracy.. “I’d rather be a pariah in Brussels than have to feel ashamed before my children, who would be deeper in debt“. Slovakia enjoyed few hours of freedom that night. One of the best feelings ever. Having Communism still in memory, one is reluctant to adopt useful idiocy… for a while. Poor Slovakia you’re surrounded by bigger neighbors who are almost certainly going to turn nasty in their declining years…. As far as “save Europe” that seems rather impossible. Greece, Portugal and Ireland could disappear from the face of the earth tomorrow and the rest of Europe would still face the same core existential problem: a 1-2% annual growth trendline in a world that grows by 4-5% ie. a perpetually compounding annual 3% loss of prosperity relative to the rest of the world. That is why Europe in the 1970s commanded about 35% of world GDP and by 2020 it is projected to shrink to 15%. The modest additional redistribution necessary to support the Greeks, Portuguese and to a lesser extent Irish will further flatten the individual effort-reward curve and make Europe’s already rapid (on a historical time scale) demise even faster. But wait! The American People, in their infinite wisdom of lately, are discovering a path to prosperity that seems to have eluded them for centuries: Follow Europe! What a comical, suicidal cry of delusion – and what a fate for a country that once commanded 6x average world per capita prosperity. I definitely stand on the side of anti-bailout movement for Greece. Unlike countries such as Ireland, Greece has never contributed and never will to the EU. So much for the “cradle of western civilization”. EU needs to make an example of Greece and kick them out of Euro zone, before they ruin the value of Euro completely. I absolutely understand position of Slovakia. Small, post-communist country that everyone thought will be nothing but a burden to EU. It proved to be stable country with great economic growth, while it’s population has nowhere near the standard of living or social security of Greece. The austerity measures for Greek population are lot less severe than everyday reality for most central and eastern European EU members, yet look who’s complaining the most. As much as SaS’ free-market capitalist and libertarian philosophy appeal to me, one thing to remember about Sulik however is that his SaS party is an opportunistic party to propagate Sulik’s business interests. It is an invitation-only party, not open to all.